Today’s blog tour is with Dr. Jeffrey Von Glahn. Jessica had always been haunted by the fear that the unthinkable had happened when she had been “made-up.” For as far back as she could remember, she had no sense of a Self. Her mother thought of her as the “perfect infant” because “she never wanted anything and she never needed anything.” As a child, just thinking of saying “I need” or “I want” left her feeling like an empty shell and that her mind was about to spin out of control. Terrified of who––or what––she was, she lived in constant dread over being found guilty of impersonating a human being.Jeffrey VonGlahn, Ph.D., an experienced therapist with an unshakable belief in the healing powers of the human spirit, and Jessica blaze a trail into this unexplored territory. As if she has, in fact, become an infant again, Jessica remembers in extraordinary detail events from the earliest days of her life––events that threatened to twist her embryonic humanness from its natural course of development. Her recollections are like listening to an infant who could talk describe every psychologically dramatic moment of its life as it was happening. When Dr. Von Glahn met Jessica, she was 23. Everyone regarded her as a responsible, caring person – except that she never drove and she stayed at her mother’s when her husband worked nights. For many months, Jessica’s therapy was stuck in an impasse. Dr. Von Glahn had absolutely no idea that she was so terrified over simply talking about herself. In hopes of breakthrough, she boldly asked for four hours of therapy a day, for three days a week, for six weeks. 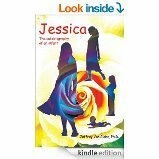 The mystery that was Jessica cracked open in dramatic fashion, and in a way that Dr. Von Glahn could never have imagined. Then she asked for four days a week – and for however long it took. In the following months, her electrifying journey into her mystifying past brought her ever closer to a final confrontation with the events that had threatened to forever strip her of her basic humanness. This excerpt is the extreme lengths Jessica went to to avoid seeing herself in a mirror. Here she’s 17. She stood in front of her dresser. Behind her, on the other side of the room, a small lamp on the nightstand next to her bed cast a pale yellow glow. Pictures of dogs with soulful eyes hung from the sky-blue walls. She reached for her hairbrush on the dresser and slowly raised her arm until her hand was poised just above her head. Then she locked her arm in place. With her eyes glued to the silhouette of her head directly in front of her, she tightened her grip on the brush. With a slow, deliberate stroke, she guided it through her long, brown hair. As her arm moved downward, her eyes tracked the moving shadow on the wall. Her mind automatically cemented into place the trace of the brush. The mental image of the slightly curved arc on the wall was her only guide as to where to comb next, besides a sixth sense based on touch. After several minutes of concentrating on her silhouette, Jessica decided she had run her brush through her hair about as many times as it usually took to get a compliment. She quietly placed it back on the dresser. I find this book interesting and have it on my TBR. Thank you, Kathryn. Hope you enjoy it. Any questions, please ask.